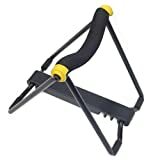 Hercules HA206 Neck Cradle Rest. At home, backstage or in the workshop - Good for changing strings, neck adjustments or even more specialist jobs. Adjustable and folds away to slip into your gig bag, case or pocket. 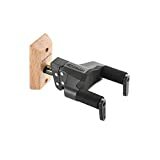 Screw-in standard wall mounting system. 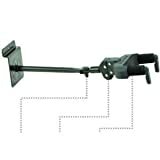 Auto Swivel yoke has an AGS hanger that can rotate automatically for different shaped guitars and basses. 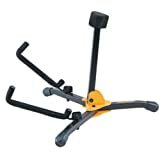 Auto Grip System yoke safely and securely holds your instrument. Specially Formulated Foam completely covers the yoke. 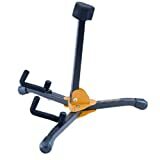 Hercules Stands GS455B Guitar Stand The Hercules Stands GS455B guitar stand keeps your favorite instrument on hand and ready to go, and its specially formulated foam covering protects your instrument's finish. The GS455B's convenient folding design makes it easy to transport and great for gigging. The HA101 AGS lock system allows guitars to be displayed without having to worry about someone playing them without permission. Pegboard mounting system. The adjustable yoke allows you to face your instrument left, right or front. The Auto Grip System yoke safely and securely holds your instrument. Specially Formulated Foam completely covers the yoke. Length: 275mm (10.8"). Load capacity: 7 kg (15.4 lbs. ).